Thanks to Dr Nassis for the invitation to write a guest post. What I’ll present herein are some facts around performance in the heat, along with some practical strategies we can use to improve a player’s performance and the effectiveness of play in such conditions. To begin, we should note that a hot environment is typically defined as an ambient/environmental temperature greater than 28°C. As noted by Tyler and colleagues (2013) in the most recent review on the topic, the 2022 FIFA World Cup will be held in Qatar, where the conditions are expected to exceed 40°C, so optimising cooling strategies has been highlighted as a research priority by a FIFA-endorsed panel of experts (Grantham et al. 2010). It’s important therefore that collectively we are aware of the issues and strategies that can improve our player’s football performance and well being in the heat. Scientific background – Why do we get hot? Remember that when we do any form of exercise, we convert our stored food energy (carbs and fat) into the mechanical energy needed for movement. This is a relatively inefficient process, whereby 75% of that energy conversion gets turned into heat. When it’s cold out, that a good thing, as that metabolism keeps our body temperature up and processes working efficiently at the right temperature. But when exercise intensity is raised, and environmental temperature/humidity is high, the resultant can be a rate of heat gain that is greater than one’s ability to lose the heat, leading to an increased core temperature. Normal core temperature sits around 37°C, and a typical exercising temperature is around 38°C. Interestingly, our brain doesn’t typically let us exercise too much past 39-40°C. Studies show that once we get in this range, the brain sends stern signals for our body to reduce its efforts or stop altogether. And that’s a good thing because it recognizes the grave danger beyond this point, including the possibility of death at just 43°C. So the reduced performance that happens when we exercise in the heat is a protective mechanism. Our brain is saying to us, you’re producing too much heat, and we need to reduce that intensity or you’re going to harm us. This happens subconsciously. Despite our desire to go harder, our brain just won’t let us. Everyone experiences this reduced work rate, even the very best players out there – they just might experience less of a decline due to their efficient use of energy, leanness, and greater ability to rid the heat. But that begs the question; if performance is key, what can we do to better football performance for our players in hot conditions? The key practical points include heat acclimation, keeping cool before and during exercise, and shortening the warm-up. It’s always about the preparation. So it's probably not surprising that heat acclimatization is the most important thing you can do to better your performance in hot conditions. This means training in hot conditions in the days preceding the event in question. About the minimum you can get away with is 4 days, and an optimal time is considered to be more like 10 days, or longer if you can afford it. In these sessions, you should be aiming to get hot during training for time periods ranging from 45-90 minutes or longer per day, depending on the fitness of your players/club. Sitting in a sauna (20-40 min) post-training is a good alternate method if a hot training environment isn’t possible. As you spend accumulative days in the heat, for each consecutive day, your player’s heart rate and core temperature tends to be lower for a given exercise intensity, and sweat rates are higher. One of the main things going on in the body to cause this to occur is a rise in the water portion of your blood, called your plasma volume. So exercise feels easier, and players perform better after a number of days in the heat. You may have heard before that we’re comprised of about 60% water (we’re a water bath). So anything small we can do to either start cooler, or slow down the process of getting hot, tends to be conducive to bettering our exercise performance. Tyler et al. (2013) just published a meta-analysis on the topic in BJSM, and importantly showed that intermittent and prolonged exercise are improved with various cooling methods. Another recent review by Jones and colleagues (2012) highlight a number of effective ways you can go about lowering your body temperature before and during exercise, including cold water baths, hanging out in air conditioned rooms, wearing ice jackets, or drinking cold fluids or ice slushies. The main way these methods work is by increasing the amount of heat one can store before attainment of those aforementioned critical core temperatures. While all of these methods have shown some success, the only one that is usually of any practical benefit is the drinking of cold fluids and ice slushy concoctions before and during the game (Jones et al., 2012). Figure 1. Likely mechanism of ice slushies effect on thermoregulation. The ingestion of cold fluids and ice slushy prior to exercise in the heat has received much interest of late. Siegel et al. (2010) were the first to show how the ingestion of 7.5 g/kg (~500-600 ml) 30 min before running in the heat at threshold, significantly increased run time by 19%, or about 10 min compared with drinking cold (4°C) fluids. For any given time point, subjects felt cooler and perceived the exercise as easier. The authors speculated that it was added heat removal from the phase change (solid ice to liquid water) that created the additional heat sink and cooler temperatures. Another interesting finding from this study was that final core temperature was about 0.3°C higher at exercise completion, suggestive of the fact that the ingestion of ice slushy may exert its effect of improving exercise in the heat through the lowering of brain temperature, which could occur conductively due to the proximity of the mouth to the brain and associated arteries (Figure 1; Siegel & Laursen, 2012). 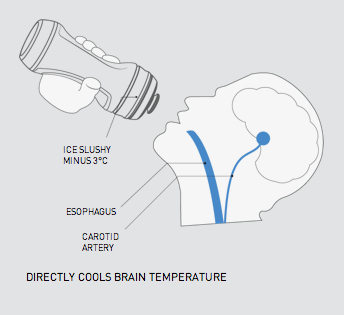 Due to both its effectiveness and practicality, ice slushy ingestion is a good means of precooling athletes prior to and during (i.e., at half time) exercise in the heat. It has been shown to be just as effective as cold water immersion (Siegel et al., 2012), and it is much easier to implement compared with cold plunge baths and ice jackets. Plus, you gain the added hydration effects once the ice turns to water. Undoubtedly, some form of warm-up is going to better your football performance. However, when it’s hot out, you run the risk of over-heating during your warm-up and storing too much of this heat before the game. Remember that starting at a lower body temperature will lower the time it will take for you to reach those critical, or very high core temperatures. Thus, if the temperature is hot, consider cutting your typical warm-up time in half. You’re going to get hot playing football this summer. The things you can do to improve your football performance in hot conditions include training in the heat in the days leading up to the competition (heat acclimatization), cooling yourself before the game and at half time using cold fluid or ice slushies, and shortening your warm-up. Remember that the coaches and support staff can get hot and bothered too, so similar advice holds true for the entire team to allow the best collective performance. 1) Prepare your team by training in the heat in the days leading into competition in hot environments (i.e., 4-10 days our, or longer). A 20-40 min sauna post-training is a good alternate method of heat acclimating if you can’t train directly in the heat. 2) Get players to ingest about 7.5 g/kg (500ml) of ice slushy drink or ice cold fluids in the 30-40 min period prior to the game. This will allow them to be cooler before play (ice slushy lowers core temperature by about 0.3-0.5°C). 3) Abbreviate your warm-up duration and intensity by about 50%. 4) Drink another 300 ml (to thirst) of ice slushy during the half time break to get another small reduction in body heat content. Follow this advice and keep your cool! 1. Grantham J, Cheung SS, Connes P, Febbraio MA, Gaoua N, González-Alonso J, Hue O, Johnson JM, Maughan RJ, Meeusen R, Nybo L, Racinais S, Shirreffs SM, Dvorak J. Current knowledge on playing football in hot environments. Scand J Med Sci Sports 2010;20(Suppl 3):161–7. 2. Jones PR, Barton C, Morrissey D, Maffulli N, Hemmings S. Pre-cooling for endurance exercise performance in the heat: a systematic review. BMC Medicine 2012;10:166. 3. Siegel R, Laursen PB. Keeping your cool: possible mechanisms for enhanced exercise performance in the heat with internal cooling methods. Sports Med. 2012;42(2):89-98. 4. Siegel R, Maté J, Watson G, Nosaka K, Laursen PB. Pre-cooling with ice slurry ingestion leads to similar run times to exhaustion in the heat as cold water immersion. J Sports Sci. 2012;30(2):155-65. 5. Siegel R, Maté J, Brearley MB, Watson G, Nosaka K, Laursen PB. Ice Slurry Ingestion Increases Core Temperature Capacity and Running Time in the Heat. Med Sci Sports Exerc. 2010;42(4):717-25. Speed, agility, quickness (SAQ) training method: what’s new? Which is the most effective recovery method after a match? Training load assessment in elite football players: should we trust what we read? Effect of cold water immersion on long term adaptations: time to re-consider the practice? How much science is enough? George Nassis. Awesome Inc. theme. Powered by Blogger.